Happy Birthday, Jane Austen! Jane was born on December 16, 1775. She lived the last eight years of her too-short life in the famous cottage on the grounds of Chawton House, where she wrote and polished four of her six surviving novels. Jane’s clergyman father had died, leaving his family dependent on the kindness of relatives. But thanks to a quirk in the family’s fortunes, Jane’s brother was able to provide a home for his impoverished mother and his two spinster sisters, Jane and Cassandra. The cottage is a pilgrimage site for Jane’s admirers (including me). 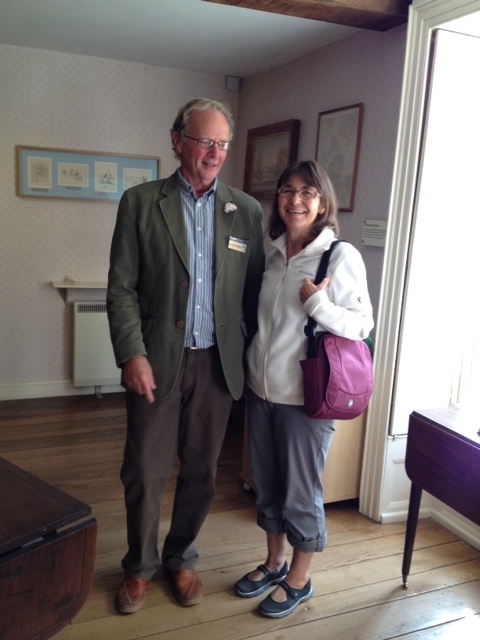 But until 2015, we could not visit the “great house” where Jane and her family were grateful guests. From the cottage in Chawton Village, Jane often walked up the country lane, past the village church, on her way to visit her brother. Chawton House must have seemed imposing. How did all this come about? Wonder of wonders, Jane’s brother Edward had won the 18th-century version of the lottery by being adopted out of the Austen family as a child. This was a great stroke of luck, but it made perfect sense to everyone concerned. As Jane would be the first to explain, people with any wealth to speak of really wanted a male heir to inherit their property and keep it in the family name. Edward fit the bill for the Knight family. Above is Edward’s silk suit, which he wore as a very lucky adopted teenager, around 1782. By adoption, Edward acquired the wealthy ancestors above, Jane and Thomas Knight, parents of his adoptive father Thomas. Thomas and his wife had no children of their own. So Edward Austen, son of a cleric of modest means, became Edward Knight and eventually inherited several grand homes and a lot of valuable property. But nothing lasts forever. Over the years after Edward’s time, the house had various owners and proceeded to fall apart, as neglected houses do. In 1992 the American businesswoman and philanthropist Sandra Lerner bought the lease and began pouring money into restoration. In 2003, the house opened as a center for the study of early women’s writing. The house is still a study center and hosts exhibits. Finally, in 2015, the house opened to tourists like me. (Weddings are also held there, no doubt tempting a lot of Jane-admiring brides). Today, the house is charmingly old-fashioned, with a bewildering floor plan, creaky old floors, and cozy corners perfect for settling in with a good book. It’s easy to imagine Jane, her mother and sisters at the dining table. The house reminds me of my very favorite Jane Austen movie, the 1995 version of Persuasion starring Amanda Root and Ciaran Hinds. The novel is set eight years after Anne Elliot has been persuaded by a well-meaning friend to break her engagement to the love of her life, Captain Frederick Wentworth, because he has no money or connections. Anne also refuses the proposal of a perfectly nice but uninspiring young squire who then marries her sister. Anne is destined to be a sad spinster. 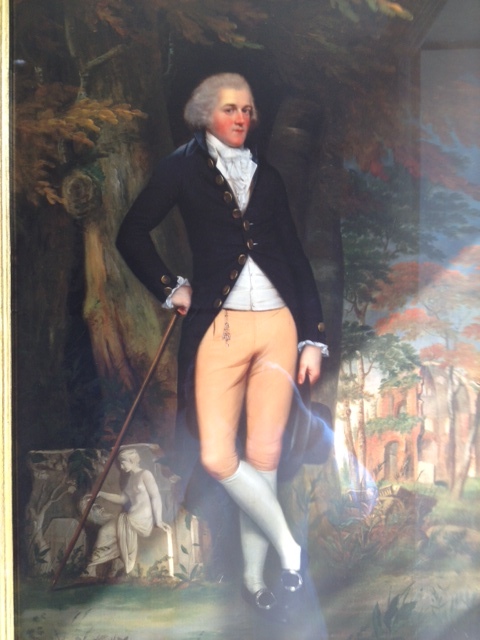 But Captain Wentworth suddenly reappears as a now-rich man looking for a wife. Of course his pride has been hurt, so Anne is out of the question. Until this and this and this happens, and we’re off into the story. Much of the action takes place in a manor house very much like Chawton House, where Anne is often a guest, just as Jane was at Chawton. I think Anne Elliot has a lot in common with her creator, Jane Austen. As in all of Jane Austen’s novels, there’s sharp satire of the British class system, the precarious financial position of most women, and the unavoidable importance of marrying wisely. There’s unbearable suspense hinging on the timely arrival of a secret love letter. There’s the tremulous joy of a long-awaited kiss. There’s true love at last for the intelligent woman who stubbornly waits for it, willing to be poor rather than suffer through a loveless marriage. It’s a fine, fine movie. And Chawton House is a fine place to imagine Jane’s life as a spinster with a whole semi-secret life as a writer of genius. This entry was posted in Books, British Isles, England, Explore Europe, Historic Homes, Literature, Why I Love England, Writers and tagged Amanda Root, Chawton Cottage, Chawton House, Ciaran Hinds, Edward Austen Knight, Jane Austen, Persuasion on December 16, 2018 by Claudia Suzan Carley. Bath’s charming Fashion Museum is always worth a wander. And there’s a large central gallery where one and all are invited to try on new identities. How does that wig fit, Sir? In this town where Jane Austen lived and wrote in the early 1800s, there are always Jane-esque muslin gowns on display. The placard explains that in the 1780s Marie Antoinette and her ladies at Versailles wore similar gowns in their private off-duty hours. In France, these refreshingly simple dresses were called chemises de la reine: dresses of the queen. They were inspired by archaeological discoveries of the ancient world in Herculaneum and Pompeii. By 1900, fashions had gone fancy and formal again. To appear at court, a lady had to wear a dress with a train that trailed at least three yards from her ankles–nine feet. I’d be hopeless in a getup like that, I’m afraid. I’d trip myself and anyone in a nine-foot radius. Sailor suits for little boys were popular in Victorian times. The fashion started when the five-year-old Prince of Wales, son of Queen Victoria, wore a miniature version of a sailor’s uniform from the HMS Victory. It was the flagship of Lord Nelson at the 1805 Battle of Trafalgar. During and after World War II, blackout cloth was about the only fabric that was not rationed. Enterprising ladies used it creatively for dresses. The one above is from 1945. In honor of the postwar accession of Queen Elizabeth II, a little girl’s mother treated her to a homemade dress printed with scenes from the coronation. The smocked dress features a border and collar with the coronation procession. I lived through the 1960s, but I have to say I would not have appeared in public in a “knickerbocker dress.” Was this really a thing? Mary Quant, the swinging 60s designer, thought so, and actually sold this little number in her boutique in 1961. Not for me, thanks. I do remember wearing geometric minidresses, though. In 2018, the Fashion Museum features a special exhibit of clothes worn by several British royal women. The exhibit starts with Princess Alexandra, subject of a previous post. Next is Queen Consort Mary of Teck. She was married to King George V.
Elizabeth, the mother of Queen Elizabeth II, wore this Norman Hartnell ball gown in 1954. My favorites were the exquisite gowns worn by Princess Margaret, sister of the Queen. The striped 1949 Dioresque gown above was designed to encourage postwar women to wear British textiles, including reasonably-priced cotton. It was the work of Norman Hartnell. Best of show, in my opinion? Margaret’s ethereal ivory chiffon evening gown with tied bolero jacket, above. The Fashion Museum is a bit off the beaten path in Bath, but worth the slight detour. And did I mention that guests are invited to try on historic outfits for size? This entry was posted in British Isles, England, Explore Europe, Historical Figures, Why I Love England and tagged Bath Fashion Museum, Elizabeth the Queen Mother, Jane Austen, Marie Antoinette, Mary Quant, Norman Hartnell, origin of sailor suits for boys, Princess Margaret, Princess Mary of Teck, Queen Elizabeth II, Royal Women Exhibit 2018 on June 14, 2018 by Claudia Suzan Carley. In honor of Jane Austen’s birth on December 16, 1775, I’m revisiting one of my favorite travel memories. In 2014, I visited the home where Jane lived in her last years. And I experienced Six (or fewer) Degrees of Separation from Jane. Jane Austen lived the last few years of her too-short life in tranquil Chawton, Hampshire, with her mother, her cherished sister Cassandra, and a family friend. The women were pretty much penniless after the death of Jane’s father. Like most single women of their time, they had to depend on the kindness of relatives for a roof over their heads. It was their good fortune that Jane’s brother Edward Knight was able to come to the rescue. Why was his name Edward Knight, not Edward Austen? He had been formally adopted by a cousin of Jane’s father, Thomas Knight. Thomas and his wife Catherine were wealthy and childless. They made Edward their heir. He inherited several estates, among them a grand house at Chawton. The house came with a sizable but cozy cottage, which Edward made available to his mother and sisters for their lifetimes. At last, in her thirties, Jane had a stable home. She had begun writing as a teenager but had more or less given it up during the years that she had no settled home. In Chawton, she established a routine of writing every morning at a little round table in front of the dining room window. Her sister Cassandra took over morning household chores, giving Jane the freedom to write. In the afternoons, they took long walks in the countryside–just like Jane’s heroines. They also spent a lot of time visiting friends and relatives, including the wealthy connections Edward Knight was able to give them. 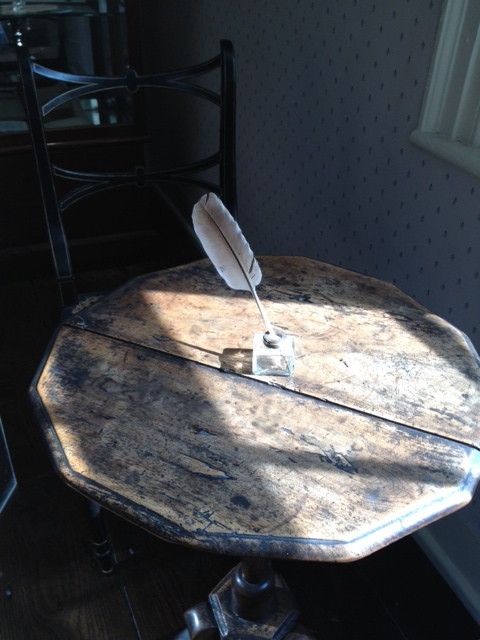 On this humble little table, Jane wrote the classics we know and love: Persuasion, Pride and Prejudice, Sense and Sensibility, Northanger Abbey, Mansfield Park, and Emma. Some of them she had begun earlier and had put away. Family lore had it that a squeaky door was purposely never oiled, so that Jane always had warning of visitors. She would hastily hide her manuscript until the visitors had left. Jane’s books dealt with the serious problems of women dependent on men for economic security. As she knew all too well from her own life, an unmarried woman without a fortune of her own had very few options for survival. Jane spun her stories with humor, but also with hard-earned experience in understanding human conflicts. I was deep in a discussion about Austen family history with a man stationed in the house, when I noticed that his name tag said, “Mr. Knight.” Could it be? Yes! My Mr. Knight was a living, breathing, direct descendant of Jane’s brother! I think he looks just like his ancestor. In Copenhagen this month, I loved seeing some outfits from Jane’s era in the Design Museum. The Empire dresses first popularized by Josephine, the wife of Napoleon, were popular in Scandinavia as well as in Jane’s England. I loved the puff detail on this one, which was made in Denmark’s colony in the Indies. (Taking care of fragile garments like this was the job of slaves–an unpleasant fact that countries like Denmark and England and America are still struggling to come to terms with). In one of her books, “Mansfield Park,” Jane touched on the subject. Still, I can dream of a ladylike life in a peaceful English village. How about a little cotton jacket for a stroll in the garden? I just found my DVD of my all-time favorite movie based on Jane’s work, “Persuasion.” It’s about maturity, regrets, making one’s own risky choices, and second chances. It stars Amanda Root, Ciaran Hinds, Corin Redgrave, Fiona Shaw, and a long list of other fine British actors. I’ll be watching it today, and feeling grateful that in her short life Jane was able to write as much as she did. This entry was posted in Books, British Isles, England, Film and TV, Historic Homes, Literature, Why I Love England, Writers and tagged Chawton, Edward Knight, Jane Austen, Persuasion on December 16, 2017 by Claudia Suzan Carley. 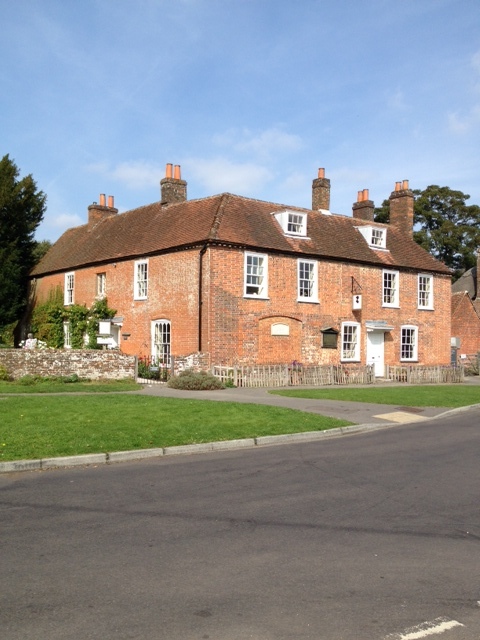 Jane Austen lived the last few years of her too-short life in tranquil Chawton, Hampshire, with her mother, her cherished sister Cassandra, and and a family friend. The women were in a precarious financial state after the death of Jane’s father. Like most single women of their time, they had to depend on the kindness of relatives for a roof over their heads. It was their good fortune that Jane’s brother Edward Knight was able to come to the rescue. Why was his name Edward Knight, not Edward Austen? 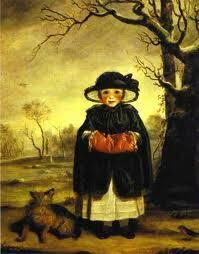 He had been formally adopted by a childless cousin of Jane’s father, Thomas Knight. Thomas and his wife Catherine were wealthy and childless. They made Edward their heir. He inherited several estates, among them a grand house at Chawton. The house came with a sizable but cozy cottage, which Edward made available to his mother and sisters for their lifetimes. Jane’s books dealt gently and humorously with the serious problems of women dependent on men for economic security. As she knew all too well from her own life, an unmarried woman without a fortune of her own had very few options for survival. In England, it always seems to me that history comes to life! This entry was posted in British Isles, England, Literature and tagged Edward Knight, Emma, Jane Austen, Jane Austen's brother, Jane Austen's home in Chawton, Jane Austen's sister Cassandra, Mansfield Park, Northanger Abbey, Persuasion, Pride and Prejudice, Sense and Sensibility on September 23, 2014 by Claudia Suzan Carley. Travel is not just about being there. Travel is about memory and anticipation. As I pack my one small suitcase for Vienna in November, I am full of memories of past trips and high hopes for this one. Last year, the Vienna Kunsthistorisches Museum had a special exhibit: “Winter Tales.” Paintings, sculpture and artifacts from all over the world were gathered in a glorious celebration of winter. My very favorite piece was this portrait of a child with a fur-and-velvet muff and a scruffy little dog impatient for her to play: “Lady Caroline Scott as Winter,” by Sir Joshua Reynolds. Winter is so often personified as Death, or as a creaky old man. Here, though, winter is a child full of hope and wonder. She gazes out at us from the barren winter grounds of her British home, her face as fresh as the day she was painted in 1776 at the age of two or three. This is not a glamorous society portrait. It is only about 57 x 45 inches (just the right size to place over my fireplace, if I could afford such a thing!) I can imagine the artist Sir Joshua Reynolds, age 51 at the time, encountering Lady Caroline in the bare winter grounds of her home. Anyone would be captivated by her rosy-cheeked face and direct gaze. I can see Sir Joshua dashing off a sketch and finishing the portrait back in his studio. It would have made a nice break from painting his more demanding adult subjects, who proudly posed with the emblems of their wealth and power: swords, globes, weighty books, jewels and fine silks. The British Peerage tells us that Lady Caroline was the daughter of the 3rd Duke of Buccleuch. She married the 6th Marquess of Queensberry (slightly lower in rank than a Duke, but who’s keeping score?) She had 6 surviving children and lived to the age of 80. So she was an exact contemporary of Jane Austen, although Jane died at age 41. I’d like to think Lady Caroline read Jane’s books. Lady Caroline was a privileged child. As she grew up, no doubt she learned that many children were cold and dirty and hungry. Her rank would come with some responsibilities to take care of the less fortunate. She lived through the American Revolution, the Terror in France, and the Napoleonic Wars. And we all know that even for the most privileged, life holds heartbreak and disappointment. But on this wintry day, all that is in the future. In this perfect moment, Lady Carolin stands on her sturdy little legs, happy to be walking about in the wide world. Vienna is an enchanting city in any season, but my favorite time there is winter. The Christmas season begins in late November, an ideal time for crowd-free travel. I do not have a fur muff or a scruffy little dog, but I am setting off for Vienna with all the anticipation of a child at Christmas. This entry was posted in Art, Austria, Vienna at Christmas, Vienna Kunsthistorisches Museum and tagged British Peerage, Christmas in Vienna, Jane Austen, Lady Caroline Scott as Winter, Sir Joshua Reynolds, Vienna Kunsthistorisches on November 24, 2013 by Claudia Suzan Carley. 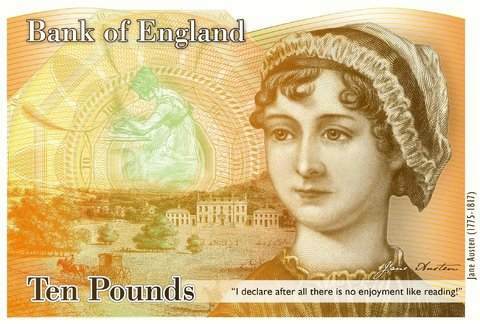 It was big news this week when the Bank of England announced that Jane Austen’s face will appear on 10-pound notes beginning in 2017. Notice the quotation below Jane’s portrait? It reads, “I declare after all there is no enjoyment like reading!” Now critics are complaining that these words were spoken not by one of Jane’s heroines, but by a materialistic snob in Pride and Prejudice, Caroline Bingley. When she speaks the line in the book, it’s only to try to gain the attention of Mr. Darcy, which to her consternation Elizabeth Bennet is monopolizing in the drawing room. This brings me to one of my favorite lines in Jane Austen, and indeed in all of literature: the opening line of Pride and Prejudice. It reads, “It is a truth universally acknowledged, that a single man in possession of a good fortune must be in want of a wife.” That one line encompasses not only the whole plot of the great novel, but the workings of an entire social and economic system. I’m sure Jane would be amused and delighted to find herself on the face of a ten-pound note, whatever the quotation under her portrait. Join me next time for more explorations into the art, history, and literature of Europe and the British Isles. This entry was posted in British Isles, England and tagged Bank of England, Bring Up the Bodies, Caroline Bingley, Elizabeth Bennet, favorite first lines of novels, Hilary Mantel, It is a truth universally acknowledged, Jane Austen, Mr. Darcy, Mrs. Bennet, new British 10-pound note, quotation on Jane Austen banknote, that every man in possess of a good fortune must be in want of a wife, Wolf Hall on July 29, 2013 by Claudia Suzan Carley.